Welcome to the MPI Heartland Chapter! MPI Heartland is made up of meeting planners and suppliers from across Iowa and Nebraska and we are a part of the MPI Global community. MPI Heartland brings networking and educational opportunities to our members, and non members, in order to advance the meeting profession. Almost every month there are opportunities to be involved in the chapter through events. 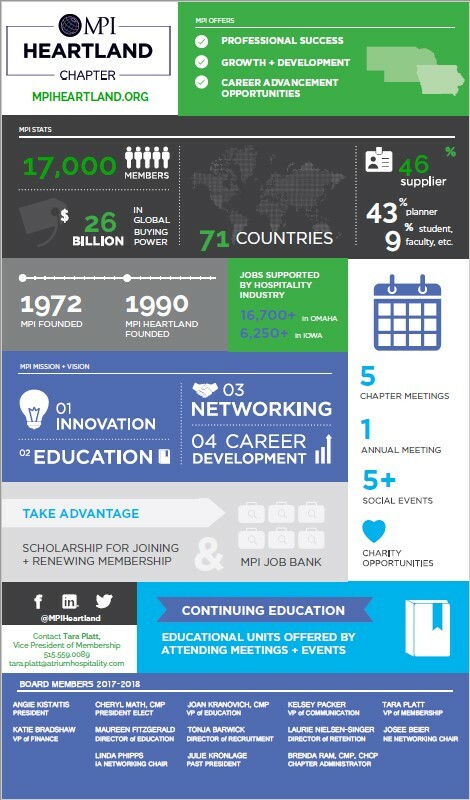 How has MPI helped in the support and growth of your career? MPI has given me so much in a short time. The connections I have made have really helped to “plug me in” to the local hotel and CVB communities in both Omaha and Des Moines. Attending MPI’s Annual World Education Congress the past 3 years, has given me the opportunity to connect with planners and suppliers from all over the world helping me to raise the profile of the brands I represent. Have you done business with any MPI members, locally or nationally? Definitely Both. I work with all of the HelmsBriscoe Associates locally. I have also booked business with several planners thru connections made on the national level. What three tips can you share with others in our industry? 1. Get Involved/Volunteer – You will get so much more out of it than you put in. 2. Pick up the phone. Make a conscious effort to talk on the phone with at least 3 clients per day vs. just email/text. It will enrich your relationships and bring more business to your organization. 3. Be a mentor. Take someone under your wing that is less experienced in our industry and pass on the knowledge you have gained. What do you do in your spare time? Any hidden talents? Fun facts about yourself? I try to spend most of my free time with my wife Darcy of 16 years, and my two boys, Jack (12) and Bennett (7). I do play-by-play for local high school football games in the Fall for 102.7, Spirit Catholic Radio. One of my favorite jobs was my 3 years working as an Archery Instructor at Hummel Park Day Camp in Omaha in the mid 1990’s. I am an avid Nebraska Cornhusker Football Fan.